La Crosse is a city in and the county seat of Rush County, Kansas, United States. As of the 2010 census, the city population was 1,342. La Crosse proclaims itself the "Barbed Wire capital of the world. La Crosse was founded in 1876, was named after the city of La Crosse, Wisconsin. La Crosse subsequently became the intended county seat, and county records were transferred there from the temporary county seat, nearby Rush Center. A county seat war ensued between the two communities, lasting until La Crosse was declared the permanent county seat and the construction of the county courthouse in 1888. In the 1960s, La Crosse became a regional center of barbed wire collecting, leading to the establishment of the Kansas Barbed Wire Museum and the nicknaming of the city as "The Barbed Wire Capital of the World". On May 25, 2012, an EF-1 tornado caused about four blocks of significant damage, and two businesses were destroyed. A third of the businesses sustained major damage. No injuries were reported. 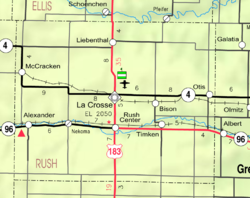 La Crosse is located at 38°31′55″N 99°18′31″W﻿ / ﻿38.53194°N 99.30861°W﻿ / 38.53194; -99.30861 (38.532014, -99.308614) at an elevation of 2,057 feet (627 m). It lies in the Smoky Hills region of the Great Plains, approximately 12 miles (19 km) south of the Smoky Hill River and 5 miles (8.0 km) north of Walnut Creek, a tributary of the Arkansas River. Sand Creek, a tributary of Walnut Creek, flows southeast around the southwestern and southern portions of the city. Mule Creek, a small tributary of Sand Creek, flows southeast through the city. Located in west-central Kansas at the intersection of U.S. Route 183 and K-4, La Crosse is 125 miles (201 km) northwest of Wichita, 261 miles (420 km) west-southwest of Kansas City, and 314 miles (505 km) east-southeast of Denver. According to the United States Census Bureau, the city has a total area of 1.05 square miles (2.72 km2), all land. On average in La Crosse, July is the hottest month, January is the coldest month, and May is the wettest month. The hottest temperature recorded in La Crosse was 115 °F (46 °C) in 1954; the coldest temperature recorded was -24 °F (-31 °C) in 1989. As of the census of 2010, there were 1,342 people, 606 households, and 350 families residing in the city. The population density was 1,278.1 inhabitants per square mile (493.5/km2). There were 722 housing units at an average density of 687.6 per square mile (265.5/km2). The racial makeup of the city was 98.5% White, 0.2% African American, 0.4% Native American, 0.2% Asian, and 0.7% from two or more races. Hispanic or Latino of any race were 2.8% of the population. There were 606 households of which 24.9% had children under the age of 18 living with them, 44.2% were married couples living together, 8.7% had a female householder with no husband present, 4.8% had a male householder with no wife present, and 42.2% were non-families. 36.6% of all households were made up of individuals and 18.5% had someone living alone who was 65 years of age or older. The average household size was 2.10 and the average family size was 2.72. The median age in the city was 47.7 years. 19.9% of residents were under the age of 18; 4.9% were between the ages of 18 and 24; 21.3% were from 25 to 44; 27% were from 45 to 64; and 26.9% were 65 years of age or older. The gender makeup of the city was 47.3% male and 52.7% female. As of the census of 2000, there were 1,376 people, 585 households, and 367 families residing in the city. The population density was 1,351.8 people per square mile (520.9/km²). There were 720 housing units at an average density of 707.4 per square mile (272.5/km²). The racial makeup of the city was 98.33% White, 0.22% African American, 0.44% Native American, 0.15% Asian, 0.22% from other races, and 0.65% from two or more races. Hispanic or Latino of any race were 1.38% of the population. There were 585 households out of which 26.5% had children under the age of 18 living with them, 53.0% were married couples living together, 6.8% had a female householder with no husband present, and 37.1% were non-families. 33.5% of all households were made up of individuals and 18.3% had someone living alone who was 65 years of age or older. The average household size was 2.20 and the average family size was 2.81. In the city, the population was spread out with 21.5% under the age of 18, 6.1% from 18 to 24, 21.8% from 25 to 44, 23.3% from 45 to 64, and 27.3% who were 65 years of age or older. The median age was 45 years. For every 100 females, there were 84.0 males. For every 100 females age 18 and over, there were 78.2 males. The median income for a household in the city was $31,435, and the median income for a family was $39,118. Males had a median income of $26,118 versus $20,600 for females. The per capita income for the city was $17,264. About 7.1% of families and 9.7% of the population were below the poverty line, including 14.1% of those under age 18 and 11.6% of those age 65 or over. La Crosse is a city of the third class, according to state statute, with a commission-manager form of government. The city commission consists of the mayor and two commissioners, and it meets on the second and fourth Wednesday of each month. U.S. Route 183 runs north-south through La Crosse, intersecting Kansas Highway 4 (K-4) which runs east-west along the northern edge of the city. Rush County Airport is located northeast of the city on the north side of K-4. Publicly owned, it has one asphalt runway and is used for general aviation. A line of the Kansas and Oklahoma Railroad runs southeast-northwest through La Crosse. One newspaper, The Rush County News, is published weekly in La Crosse. La Crosse is in the Wichita-Hutchinson, Kansas television market. ^ "2010 City Population and Housing Occupancy Status". U.S. Census Bureau. Archived from the original on July 26, 2011. Retrieved March 27, 2011. ^ Griffin, Pete (May 26, 2011). "What's In a Name? Slogans Can Make or Break a City, Experts Say". Fox News. Retrieved March 19, 2014. ^ "Profile for La Crosse, Kansas". ePodunk. Retrieved 22 June 2014. ^ "Welcome to Rush County, Kansas..." Rush County, Kansas. Retrieved 2011-06-24. ^ "The History of the Kansas Barbed Wire Museum". Kansas Barbed Wire Museum. Retrieved 2011-06-24. ^ La Crosse residents continue to clean up after twister ; KWCH; May 27, 2012. ^ a b c "2003-2004 Official Transportation Map" (PDF). Kansas Department of Transportation. 2003. Retrieved 2011-06-22. ^ a b c d "General Highway Map - Rush County, Kansas" (PDF). Kansas Department of Transportation. 2010-10-01. Retrieved 2011-06-22. ^ "City Distance Tool". Geobytes. Retrieved 2011-06-22. ^ a b "Average weather for La Crosse, KS". The Weather Channel. Retrieved 2011-06-22. ^ "La Crosse". Directory of Kansas Public Officials. The League of Kansas Municipalities. Archived from the original on 2011-05-05. Retrieved 2011-06-22. ^ "City Departments". City of La Crosse. Retrieved 2011-06-22. ^ "La Crosse Public Schools". La Crosse USD 395. Retrieved 2011-06-24. ^ "La Crosse, Kansas". City-Data. Retrieved 2011-06-24. ^ "K94 - Rush County Airport". AirNav.com. Retrieved 2011-06-22. ^ "About this Newspaper: The Rush County news". Chronicling America. Library of Congress. Retrieved 2011-06-24. ^ "FMQ FM Radio Database Query". Federal Communications Commission. Archived from the original on 2009-08-25. Retrieved 2011-06-22. ^ "Station Information Profile". Arbitron. Retrieved 2011-06-22. ^ "Contact Us". KKDT FM. Retrieved 2013-06-18. ^ "KISS 104.7". KXNC. Retrieved 2011-06-22. ^ "Kansas TV Markets". EchoStar Knowledge Base. Archived from the original on 2011-07-26. Retrieved 2011-06-24. Wikimedia Commons has media related to La Crosse, Kansas. This page was last edited on 25 March 2019, at 19:23 (UTC).